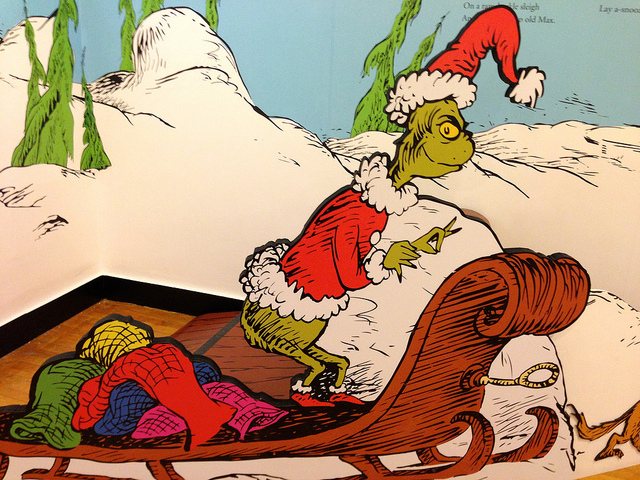 How the Grinch unknowingly almost committed mass Genocide. Chris Meledandri, known for his work with the films inspired by the Dr. Seuss books and The Despicable Me franchise, has expanded his list of hits with his recent animated rendition of The Grinch. His twist on a much loved classic has sparked a lot of attention in the lead up to Christmas. A well known story, the Grinch (a hairy green creature) attempts to sabotage and steal Christmas due to his hatred for everybody else’s cheer and joy during the festive period. On the surface, it seems like a cute and innocent storyline, especially with Meledandri polishing up the animated Grinch making him appear less scary and miserable. It is the perfect Christmas movie to sit with the family and watch. However, we must ask whether there is a more twisted side to the tale? Well according to one theory, this is definitely the case. The theory claims that the Who’s in Whoville are not making noise because they particularly like Christmas, but rather to prevent their annihilation and extermination. This theory starts with Horton Hears a Who! from the Dr. Seuss trilogy also adapted into a film by Meledandri. Horton an Elephant one day stumbles upon a spec whilst taking a dip in a pond. Hearing a yelp coming from the dust spec Horton investigates and soon discovers a tiny civilization of beings called Who’s living amongst the spec. According to the Dr. Seuss book, the Who’s barely made any noise during this time period. However, this would all change. When Horton tries to prove their existence the other animals think he is crazy, especially Mayor kangaroo who ties him up and goes to throw the spec into boiling oil. All is resolved however when the Who’s make a sufficient amount of noise in order to be heard. The issue seems to have been sorted, however with the times changing the Who’s in Whoville become obsessed with keeping their world safe. They must make the loudest noises possible so as to prove their existence and ensure they do not catalyst their own deaths. The Grinch was released after the book of Horton Hears a Who!. Taking into account that the people in both films are called Who’s and they both live in Whovilles, you can see there is an evident connection. Knowing when both were released also debunks any doubts of a connection based on the difference in representation of the Who’s in both the films and books. Also, the Who’s of the Grinch film released years after the books, are described as very noisy beings not just during Christmas but all the time, because their fear of annihilation drives them to insanity in attempt to live. The theory further suggests that this nose increases over Christmas when children receive gifts, as everyone is happier and wants to sing as they are infected by the spirit of festivity – their loud volume being a reflection of this. And it is this very notion which causes the Grinch to lose his mind! Moving on, it is suggested that by trying to destroy Christmas, the Grinch could possibly be killing off the whole of Whoville and not be aware. The theory claims that because he lives in a cave and was not civilized with the rest of the town, he has not been made aware of the troubles that lie ahead. Thus, resulting in his quite ignorant decision to eradicate Christmas and to silence the citizens of Whoville. Furthermore, when the Grinch succeeds in his plans of destroying Christmas, the Who’s still gather to sing. People assume its because they still have the Christmas spirit, but according to the theory, the who’s are still singing because even through their Christmas is ruined, they can’t keep silent or else they may all perish. Drawing to a close, maybe things are not always as they seem. Perhaps you will watch the Grinch with a different perspective this year. You may even find the Who’s less annoying watching the original film a second time round (or hundredth time in my case), or watching Meledandri’s new animated version. ← Exclusive Interview with Jordy Kerwick on his Exhibition @ Delphian Gallery.